Established in 1921, the Majestic Theatre downtown remains one of the grandest buildings in Dallas. In its early days, the 1,704-seat theater hosted a variety of Vaudeville acts, and big names such as Mae West and Harry Houdini performed on the stage. As the years went on, movie premieres with actors like John Wayne and Jimmy Stewart drew crowds. During a major renovation in 1970s, the 23-karat gold leaf was restored in the interior, and the Renaissance Baroque exterior was restored. 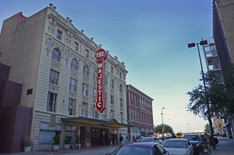 In 1983, the Majestic was named to the National Register of Historic Places. Today, the theater is managed and booked by the City of Dallas Office of Cultural Affairs. Plays, concerts, comedy shows, dance competitions, and more are held on the Majestic stage regularly. The theater also boasts the Terrace Room, which overlooks the main lobby and makes an elegant place for a party.